Definition: Ménière’s disease (MD) is a disorder that affects the inner ear that is characterized by vertigo, tinnitus, and progressive deafness. Typically only one ear is affected, at least initially; however, over time both ears may become involved. Ménière’s disease is caused by a dysfunction in the inner ear. The labyrinth is a system of small fluid-filled channels that send sound and balance signals to the brain. It can develop at any age, but it is more likely to happen to adults between 40 and 60 years of age. It is an unpredictable disease that requires various types of treatment. Symptoms include vertigo, dizziness, nausea, and a progressive loss of hearing. 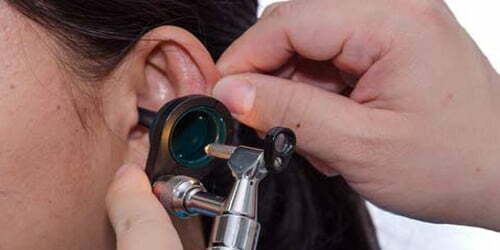 Diagnosis is based on the symptoms and frequently a hearing test. Other conditions that may produce similar symptoms include a vestibular migraine and transient ischemic attack. There is no known cure. A low salt diet, diuretics, and corticosteroids may be tried. Physical therapy may help with balance and counseling may help with anxiety. Injections into the ear or surgery may also be tried if other measures are not effective but are associated with risks. The use of tympanostomy tubes, while popular, is not supported. 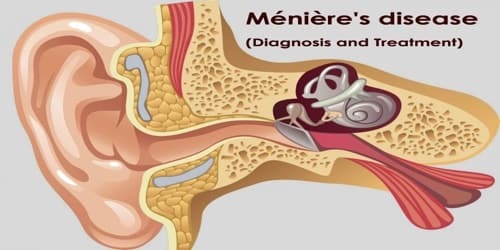 Diagnosis and Treatment of Ménière’s disease: Ménière’s disease is most often diagnosed and treated by an otolaryngologist (commonly called an ear, nose, and throat doctor, or ENT). However, there is no definitive test or single symptom that a doctor can use to make the diagnosis. Other vestibular conditions that should be excluded include vestibular paroxysmia, recurrent unilateral vestibulopathy, vestibular schwannoma, or a tumor of the endolymphatic sac. Although there is no cure, treatment can help manage some of the symptoms. Diet, physical therapy and counseling, and some surgical approaches can be used to manage it. Diet. There are some dietary changes that can help reduce fluid retention. Generally, the less fluid retention a person experiences, the less severe and frequent the symptoms will be. Medications. The most disabling symptom of an attack of Ménière’s disease is dizziness. Prescription drugs such as meclizine, diazepam, glycopyrrolate, and lorazepam can help relieve dizziness and shorten the attack. Some injections into the middle ear may improve symptoms of vertigo. They include gentamicin, an antibiotic, and steroids, including dexamethasone. Physical therapy. While the use of physical therapy early after the onset of MD is probably not useful due to the fluctuating disease course, physical therapy to help to retrain of the balance system appears to be useful to reduce both subjective and objective deficits in balance over the longer term. Counseling. The psychological distress caused by vertigo and hearing loss may worsen the condition in some people. Counseling may be useful to manage the distress, as may education and relaxation techniques. The hearing is often mostly preserved; however, the surgery involves cutting open into the lining of the brain, and a hospital stay of a few days for monitoring would be required. People may start out with only one symptom, but in MD all three appear with time. Hearing loss usually fluctuates in the beginning stages and becomes more permanent in later stages. MD has a course of 5–15 years, and people generally end up with mild disequilibrium, tinnitus, and moderate hearing loss in one ear. Lifestyle Changes: From 3% to 11% of diagnosed dizziness in neuro-otological clinics are due to Meniere’s. The annual incidence rate is estimated to be about 15/100,000 and the prevalence rate is about 218/100,000, and around 15% of people with Meniere’s disease are older than 65. It’s also important to quit smoking and to avoid any allergens. Both nicotine and allergies can make the symptoms of Meniere’s disease worse.